Pregnancy Diet Plan – Tips and Advice! Best Pregnancy Diet for Improved Fertility! At what stage, during Pregnancy, is it most important to be eating well? According to Professor Hazel Inskip (Statistical Epidemiologist): “Getting the right start in life is vital, and that means even before conception. If we can get it right, we can reduce the burden of obesity and non-communicable diseases in the community”. I feel it is so important to share this message with everyone who is thinking about starting a family. Your baby’s health starts with you and your partner’s health long before conception. What does the word ‘DIET’ mean? The word ‘diet’ comes from the Greek word διατροφή (diaita) which means ‘way of living’. In other words, a ‘healthy diet’ is a healthy ‘way of living’. Following those ‘lose weight fast’ diets that are so restrictive and limiting, are guaranteed to fail as they are unbalanced, unsustainable and therefore unhealthy. Every time you use the word ‘diet’ I’d like you to think about it being a ‘way of life’ which restores and maintains your health and vitality. The best diet for improved fertility should be enjoyable, convenient and filled with all the health promoting nutrients that provide energy and overall wellbeing. Food and eating would be so much less complicated if we could all go right back to basics and follow the three key rules for healthy eating that were fundamental for the wellbeing of our ancestors – as quoted by Michael Pollan: “Eat food. Not too much. Mostly plants”. This makes so much sense, especially if you think about what many of us consume today. Is it all really considered ‘food’? All those refined, processed, packaged, artificially sweetened, flavoured, salted, chemically preserved, genetically modified, fumigated, sterilised, sanitised and irradiated objects we swallow (often on a daily basis)………… should we really be calling that ‘food’ ??? In today’s world of excess, how many of us know moderation? When is enough enough? We can blame some of this on the fact that the ‘non-food’ we are consuming has lost most of its original nutrients and goodness. And because of the various forms of processing these ‘foods’ have undergone, there’s not much mother earth goodness left. So how can any human being who has been designed to digest and absorb whole foods in their most natural unadulterated state, possibly feel truly satisfied, nourished, energised and healthy enough to procreate………. after scoffing down stuff that should not be called food? If we made sure that our meals consisted mostly of a variety of dark green and brightly coloured plants (preferably non-genetically modified and organic), we would be sure to get all the required vitamins, antioxidants, minerals, prebiotics, and other nutrients we need on a daily basis, without having to do any serious calculations for our ‘recommended daily allowance’. In general, you need to focus on the enjoyment of eating real, whole foods, as close to their natural state – the way mother earth intended (and organic). 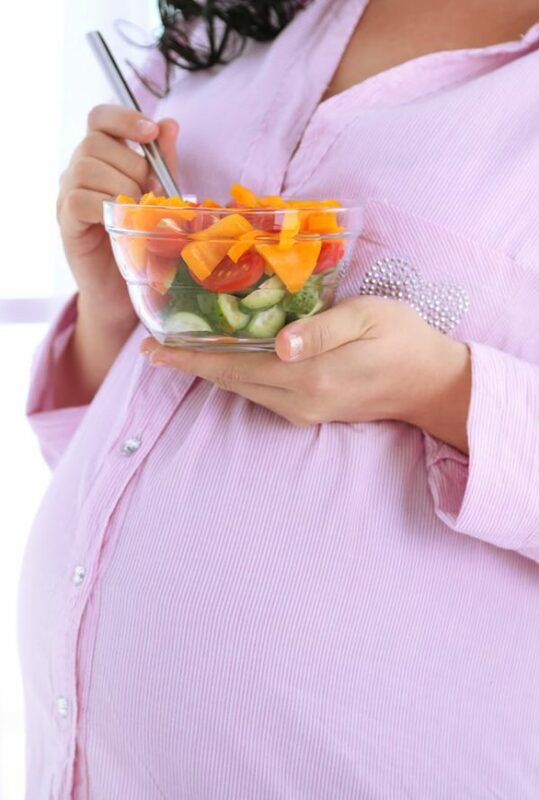 It is important to start your healthy eating regime at least 6 -8 months BEFORE attempting to conceive. In fact, following a Mediterranean diet at least 6 months prior to IVF has been shown to increase the chances of a successful pregnancy and live birth. This will not only improve your chances of fertility, a healthy pregnancy, birth and baby, but you will also lessen the risks associated with gestational diabetes and the consequences that follow on from that, including giving birth prematurely. Researchers from the Boston University School of Public Health (BUSPH) have found that the intake of one or more sugar-sweetened beverages per day–by either partner–is associated with a decreased chance of getting pregnant. Obesity, defined as body mass index (BMI) greater or equal to 30, has been shown to increase the risk of first trimester miscarriage as well as subsequent pregnancy loss. If you require any specific dietary considerations for improving your fertility, I will need to address them on an individual basis. Some examples may include fertility related conditions such as repetitive pregnancy loss/miscarriage, PCOS or endometriosis; the need to lose weight or to detox prior to conception; as well as allergies or food intolerances. In my forthcoming blog, “Optimal Eating Strategy” I will explain in detail, everything you need to know about nutrition for your good health, fertility, pregnancy and your growing baby.